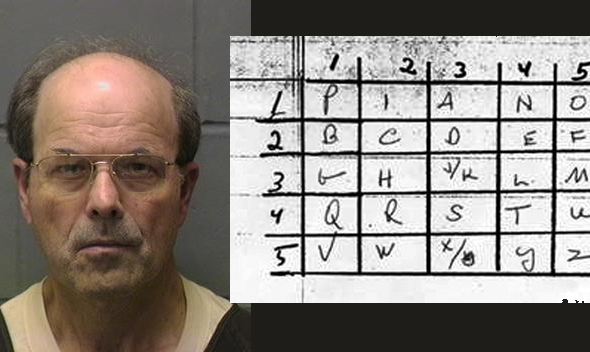 Dennis Rader (born 1945), better known as the “BTK killer”, murdered ten people in the Wichita, Kansas area between 1974 and 1991. 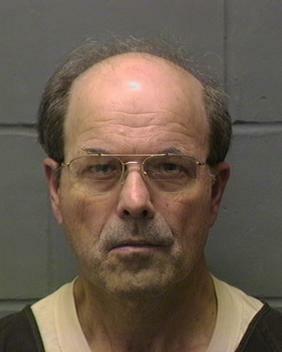 He gave himself the name “BTK”, because he would (b)ind, (t)orture, and (k)ill his victims. 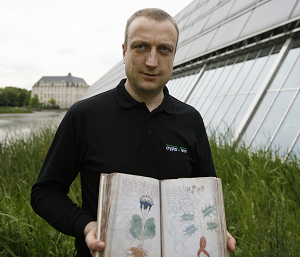 As far as I know, there are only three sources that explain this cryptogram: a Cryptologia article (paywalled) by Jeanne Anderson, a blog post of mine (German), and a Spiegel Online article (German) based on my blog post. Then, one reads out number pairs line-wise (2/5, 5/3, 4/3, 3/1, 4/4, 2/4) and transfers the pairs to letters using the same table: WM LA TR. The plaintext of the message Rader sent to the newspaper is: PJ PIANO LET BEATTIE KNOW. Rader encrypted the two parts of the message (before and after the hyphen) separately and made a few mistakes. This makes decryption quite confusing. 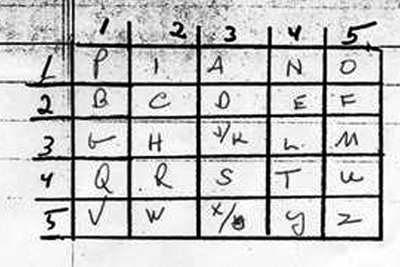 PJ PIANO (“Project Piano”) is a name Rader gave to one of his murders. LET BEATTIE KNOW refers to a policeman nicknamed “Beattie”. As it seems, the main purpose of this message was to confuse police investigators, while its content was irrelevant. This message was by far not the only one the BTK killer sent to police, but all others were not encrypted. The second reason why I knew about the BTK Killer is not really crypto-related, but it has to do with IT security. After having committed ten murders within 17 years and after police having spent millions of dollars to catch him without success, Dennis Rader finally made a ridiculous mistake. Apparently, Rader thought that sending a message to police on a floppy disk instead of using a piece of paper would make things a little easier. So, on February 16, 2005, Rader mailed a purple 1.44-Megabyte floppy disk containing a text file to the KSAS TV station in Wichita. When police examined the disk, they discovered a deleted Word file, which could easily be restored. The metadata of this file contained the words “Christ Lutheran Church”, and the document was marked as last modified by “Dennis.” An internet search determined that a “Dennis Rader” was the council president of the Wichita Christ Lutheran Church. A week later, Rader was arrested. Via a Google search, I recently learned that there is a third reason why the BTK killer case is interesting from the point of view of somebody interested in crypto and IT security. In 1978, TV station KAKE placed a subliminal message in an interview on the BTK Killer in an effort to get him to turn himself in. 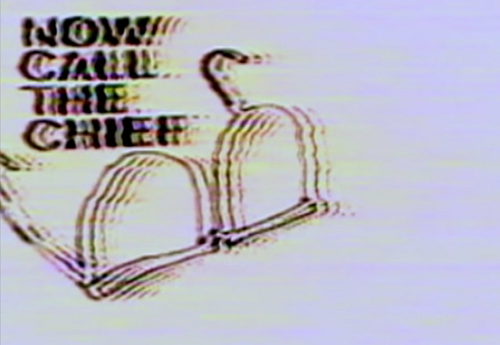 The subliminal message included the text “Now call the chief”, as well as a pair of glasses. The glasses were included because at one of the crime scenes, a pair of glasses had been found. A short video of this experiment can be found on YouTube. This attempt to catch the killer was probably influenced by James Vicary’s popcorn experiment, which allegedly proved that people could be manipulated with short messages hidden in films. Later, it became known that this experiment had been a fake and that the method didn’t work. It therefore comes as no surprise that the attempt to catch the BTK Killer with a subliminal message was unsuccessful. I wondered what the numbers 7 and 14 mean, since the Polybius square used for the bifid encryption contains nothing but letters. According to Jeanne Anderson’s article (here without paywall: https://dokumen.tips/download/link/breaking-the-btk-killers-cipher) these numbers are only checksums that indicate how many letters precede them.